Through Discovery Arcade, past Le Petit Train de Cirque, across pavement that wouldn't dare crumble stateside, is a small bench sandwiched between two slightly overgrown hedges. The ground is littered with ash. This is Disneyland Paris, and despite signs to the contrary, this is a popular spot for smoking. The decision to place a Disney property in the outskirts of Paris was a strange one. 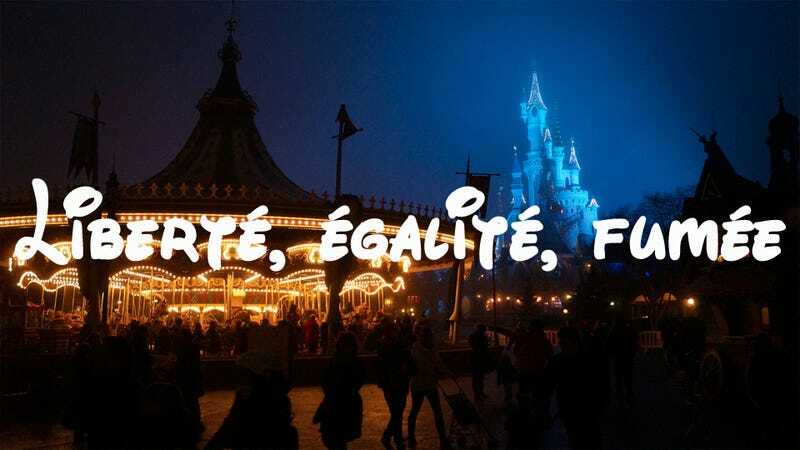 Disney's well-scrubbed and earnest family mecca is an odd choice for France, with its cold rains and high rates of cultural indifference. And so in defiance of the American Mouse, the French cling to what's known: cigarettes and ennui. Technically you're not supposed to smoke in the park outside of designated areas but, this being France, everyone smokes wherever they want anyhow. Herewith, the best places to light up a Gauloises. Between the two popcorn vendors by Belle's Magical Alcove. Be Our Guest! Be Our Guest! Put your sanity to the test! Inside the Haunted Ballroom where your Phantom Manor Doom Buggy has been stuck for fifteen minutes to accommodate either ghosts or extremely slow tourists. People have been known to dispose of the ashes of their loved ones on this ride, so the ash from your cigarette will either go unnoticed or at least be slightly less macabre detritus. The waffle hut being occupied by a murderous-looking man who is not in character. If you offer him a smoke he might spare your life. The three-hour line for a runaway train ride puzzlingly modeled puzzlingly after the American West. In the extremely cramped, steampunk confines of Captain Nemo's Nautilus. Like "No", "Get me out of this fake submarine" sounds the same in a variety of languages. En le saddest animale du le carrousel. Les escargots, le grenouille, les other animals we usually eat instead of sit on. As it turns out, this is not the ideal climate for family fun. You know you feel the same way. Fielding ten hours of nonstop hugs from sticky children is no way to live. E. Sparling writes and runs in Northern New Jersey. Flygirl is Jezebel's new travel blog dedicated to adventures big and small, tips and tricks for navigation, and exploring the world at large. Have a story or an idea? We're always taking submissions; email us with "Flygirl" AND your topic in the subject line. No pitches in the comments, please.